Do you travel for business a lot? Have you found yourself exploring the world more and more often? Would you like to be able to bring your guitar with you without the concern of whether or not you can bring your guitar? I can help and it’s not complicated. In our ever changing world, people are traveling more and more often. Whether it’s for work, leisure, or adventure. In a big city like Seattle, many of my students often travel monthly if not more often. Some every week for work. Many are also from other parts of the country or world and go home to visit family and friends regularly. The solution is simple. You can bring your guitar on the plane. Do not check it. Bring it on in place of your carry on item and ask to put it in the coat closet by the front of the plane or just put it overhead where you would normally store your bag. I do this often without any issue. I also know many others who do it. I unfortunately know someone who checked their $3000 guitar and as expected the airline destroyed it. You will need to check your luggage, but this isn’t too expensive and it will provide you the opportunity to play guitar for your whole trip! If you are traveling for work, then you will be in a hotel which is ideal for practicing because there are, or should be, zero distractions. What is great about this is it will keep you from boredom in an unfamiliar city and it will help you unwind from the long days of business trip meetings. If you are traveling for leisure you can still bring your guitar. But what if you are staying with your family? Even better! They will enjoy hearing you play and may be inspired to start themselves. If you aren’t comfortable showing off to your relatives, then use it as an excuse to get away from all the family drama and have alone time for an hour each day. How about traveling for adventure? Well the guitar is quite fitting for an adventure soundtrack. 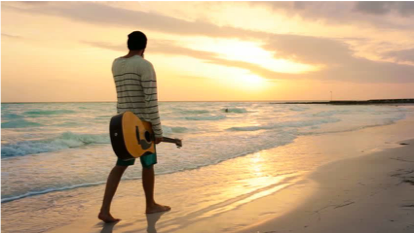 Imagine playing guitar at the Grand Canyon or on the beach? Yes, please. I will say, if you have an acoustic guitar, bringing it on an airplane might be more tricky unless it has a thin line body. Also, make sure you use a soft case, not to be confused with a gig bag. Gig bags are pretty thin and barely protect your guitar. A good soft case is going to have support for the guitar neck and some protective padding so it will be protected traveling. Definitely do not check a soft case, this will guarantee your guitar is turned into kindling. These are simple logistics, but the most important aspect hasn’t yet been covered. You must plan to practice and play your guitar before your trip. Traveling can seem like a whirlwind of business and if you don’t plan to practice, you won’t. On top of planning, commit to accomplishing something on guitar during your trip. Make it small and simple. Like memorizing a new song or guitar solo. You will be that much further along in your guitar playing by the time you return home. Some might say, why bother practicing, I will only be gone a week? In some cases it is not a big deal. If you travel a lot then it would be best to just get into the habit of bringing your guitar and practicing. Consistent practice is key to lasting progress. On top of all of that, having a committed guitar teacher who can guide you and hold you accountable throughout the whole process is going to make all of this a lot easier. They will also be able to help you plan for your trips so you continue to grow as a musician every week of the year. About The Author:Ryan Duke is a professional musician, guitar teacher, and owner of Seattle Guitar Mentor providing the very best guitar lessons in Seattle, WA.